I did a few sketches while on a busy visit to the UK in May and June, more than I did on my last visit – see blog post https://lindahoweelyart.co.za/2017/10/. The trip started with a week in Looe, Cornwall, with visits to St Ives, Penzance, and Polperro. 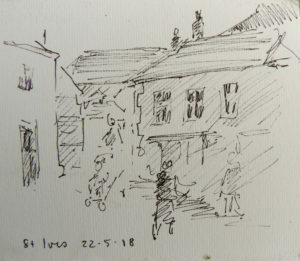 Quick sketch of a street in St Ives. It’s a magical place, full of quaint narrow lanes, beautiful views and plenty of art galleries. 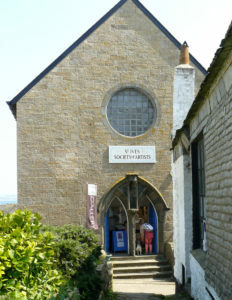 There were some open studios and exhibitions at the St Ives Arts Club and the St Ives Society of Artists’ Summer Exhibition There was some lovely work on show. An old fishing town with houses on both steep sides of the tidal river, Looe is a visual delight. 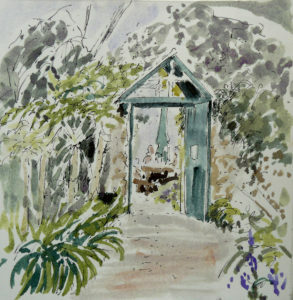 The sketch below was done sitting on the back of a bench half way up a hill and looking up river towards the bridge. The seagull posed obligingly for quite a while. 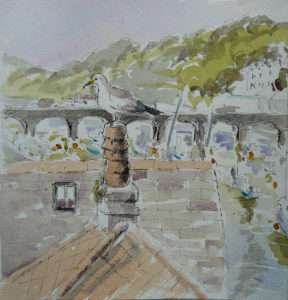 A view of Looe with Seagull. We walked the magnificent coastal path to the quaint town of Polperro. 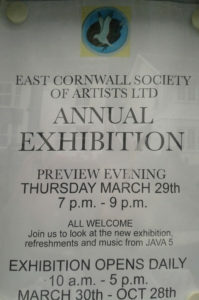 Popped in at the East Cornwall Society of Artists Annual Exhibition there. As well as paintings, they had some really nice ceramic pieces on show. Garden of Remembrance next to the Penlee Art Gallery, Penzance. At the end of the trip we visited Kingsbridge and Salcombe in Devon. 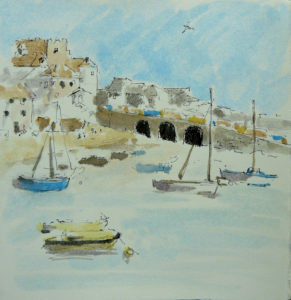 While in Salcombe I looked at the Salcombe Art Club Summer Exhibition, which was very good. 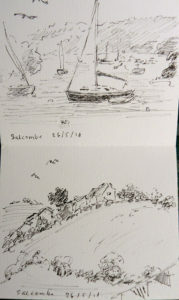 http://www.salcombeartclub.org.uk/ I also had time for two quick sketches of views from the window of a pub in Salcombe. Quick sketches done in Salcombe.